2m DVI Cable, DVI-D single link. 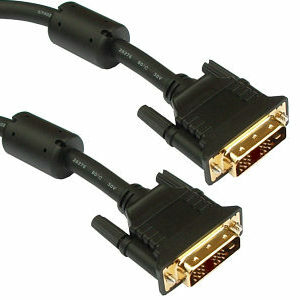 2m DVI monitor cable with gold plated contacts for minimum resistance. Supports resolutions up to 1920 x 1200. VGA Splitter 2 Port Connect a PC to 2 Monitors. 2 port VGA Splitter, connects a PC to 2 monitors. Compatible VGA, SVGA and Multi-Sync Monitors. Duplicate one signal input to 2 outputs. 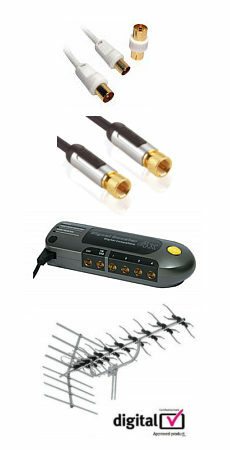 Can be cascaded, increasing the total number of video outputs. Effective transmission distance: 65 meters. (210ft). Automatic power-save when signal is lost. Video bandwidth 350 MHz. Dimensions 20mm x 85mm x 180mm, metal casing. Please note the input socket is male so will need a male to female VGA cable. 3m Mini Displayport Extension Cable, Male to Female. Male to female mini displayport monitor extension cable. Male to female connectors. Gold plated. Colour white. Length 3m. Ideal for connecting a Mini DisplayPort equipped MacBook Pro to your 27-inch iMac for use as an external display. VGA Y Splitter Cable. VGA Y splitter cable, connect 1 PC to 2 monitors. VGA male to 2x VGA Female splitter cable. Length 0.2m Max recommended resolution 1280 x 1024 with cables no longer than 2m.